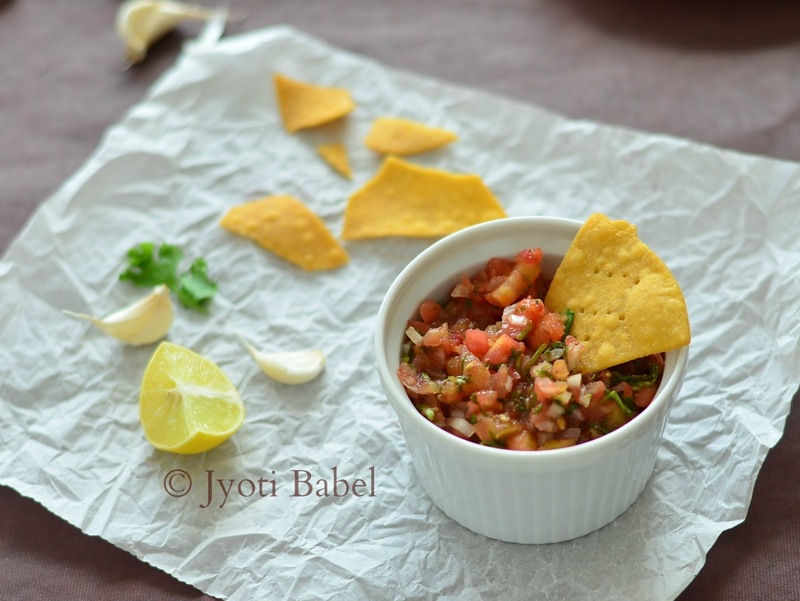 Roasted Tomato Salsa is one of the must accompaniments with tortilla chips. It is very easy to make it and the best thing is that it can be made with ingredients readily available in our kitchen. While it can be made instantly, it is best to make it a few hours ahead of serving as the resting time helps in enhancing the overall flavour. This is my last day of Blogging Marathon under the theme 'Explore Latin American Cuisine' and today I am going to share another Mexican dip that I made to go with my Homemade Tortilla Chips. I make this dip every time, I make anything Mexican for dinner. If you like your salsa a bit chunky, chopping roasted tomatoes will do. But, if you like it little saucy, puree half of the tomatoes and chop the rest. I like it both ways but, for this post, I have made a chunky salsa. 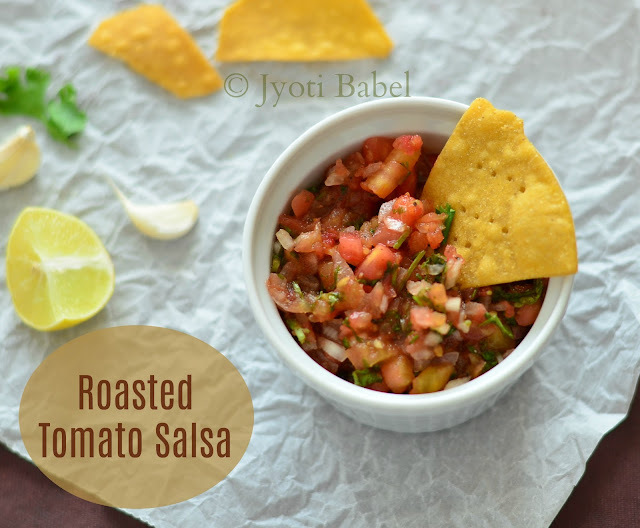 Let's check out the recipe for roasted tomato salsa now. 1. Insert a metal skewer into the tomato and roast it on open flame over gas stove till the skin turns blackish and cracks in places. Let it cool a bit and peel the charred skin. Chop the roasted tomato finely. 2. In a bowl add all the ingredients and mix it will. Cover it will a cling film and store in the refrigerator. Salsa always tastes better if it is prepared a few hours in advance before serving time. 3. Serve it chilled with tortilla chips or with any other Mexican delicacies. Yes this was my favorite dip when I had made a mexican meal..your pictures make it look so very inviting.. The salsa looks wonderful , I make it in the similar manner , except they I roast the capsicum too ! Lovely recipe you have tempted me enough with all the three lovely posts!! an interesting twist to the normal salsa by using roasted tomatoes. Sounds delicious. I now wish I can make all the 3 dishes immediately. Wow, am just drooling over that bowl of salsa, loving it. Love the roasted flavor of tomatoes. This looks super yum. What a delicious roasted tomato salsa you got there. Looks amazing. Wow, roasting makes the salsa so aromatic na!!! Love this simple dip!